More than ten percent of the political candidates that take part in the elections for the Provincial Estates are also candidate for the Water Board elections of March 20 2019. In total 529 candidates can be elected for both levels of government. Every province has several of these candidates, but the numbers differ strongly per region and province. LocalFocus and Open State Foundation compared the candidate lists of the Provincial and Water Board elections. 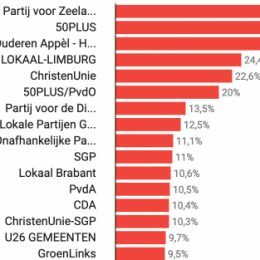 In the province of Zeeland 30 percent od the candidates appear on both lists, while in the province of Flevoland only four percent occur on both. In the Water Board Law it states that membership of the water board council is incompatible with the membership of the Provincial Estates. Politicians that will be elected for both organs have to turn down one of the functions. About 1.200 candidates for the provincial elections were also candidate for the municipal elections of march 2018. We did not investigate how many of these candidates are actually elected and are still a member of the municipal council. 162 politicians occur on all lists: province, water board and municipality. Again the province of Zeeland has the mosts candidates, 38 or 10% of all the provincial candidates, that take part in alle three elections. Which parties have the most candidates on several lists? We make a unique ID for every candidate and we checked if the candidate was found on several lists. There is a small chance that candidates have the same initials, first name, last name, gender and place of residence and are not the same person. If you find any errors, feel free to contact us.